Towards the beginning of last year I shared tips on how to negotiate for a better rate after being inspired by a Facebook friend tallied her friends to see how much they paid for internet and if she was paying too much. Long story short: she was. Her comment inspired a post last year and it was also popular on the blog, so I figured I would share the same tips for 2015. It is always good to look at and adjust your budget accordingly and to make sure you aren’t overpaying for services. Sometimes you may sign on to a great deal but when the contract expires, the price can go way up. It’s important to make sure you stay on top of your expenses and negotiate for a better rate when you can. Cable, internet, phone, insurances, and more can be negotiated and can save you a lot of money over the course of a year. Call your current provider: Tell them you’d like to stay with your current provider but the price is too high and ask if there is anything they can do to help. They may be able to switch you to a current/better promotion, give some suggestions on how to lower the rate, or tell you there’s nothing they can do. Be nice and be positive, but let the know the price is above your means and ask what they can do. Speak with the right person: If the first person you spoke to couldn’t help, politely ask to speak to a supervisor or someone better fitted to help. Sometimes the first customer service person can’t do as much as a supervisor or a retention employee. Speaking with more than one person can sometimes help land a better rate. Call your current provider’s competition: If your current provider can’t help or want to get the lowest rate possible, call different providers for their current rates. Take in account different promotions and terms to find the best fit. (For example, when I was switching internet providers, Comcast actually had a lower rate for the first 6 months, but RCN was just a little more and the rate was locked in for a longer period of time, plus better speed). Threaten to leave/leave your current provider: If you find a better rate and service with another company, it may be best to move on. However, if you are happy with your current provider, minus the high rate, threaten to leave or cancel the bill. You may be switched over to a retention department or a manager who will have more moving power before or when you cancel. However, it may be best to switch providers to get a lower rate. Change/Adjust your plan: Another way to reduce the cost of your bill is to reduce services. Do you need HBO, DVR, unlimited data, special insurance, or more. Cut services that are not worth the money. Also, make sure to watch your monthly bill to make sure the price has not risen. If you are automatically paying your bills, you may not even notice an increase. Pay attention and call when you notice the price has gone up. 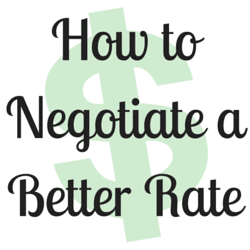 Do you have any tips for negotiating better rates? Do you call and negotiate rates regularly?